Greetings and happy spring to all! Winter is definitely over, the last of the snow here disappeared yesterday. Its been a fairly wet spring, and warmish the last few days which has really begun to green things up. Its great to hear birds early in the morning again, its hard not to love this time of year. I just opened our box of Newtown Pippins in our cooler the other day, and they look great. Firm, crisp and tasty for sure. As you can see from the pics , they’re just beginning to turn yellow (ripe). We’ll eat these until they run out or until strawberries start to ripen in June and fresh fruit becomes more appealing. I’m still eating Jonathan, Prairie Spy, Spitzenburg, and King David apples. They’re all good and keep well, but don’t have the long term keeping qualities as well as the Pippins do. 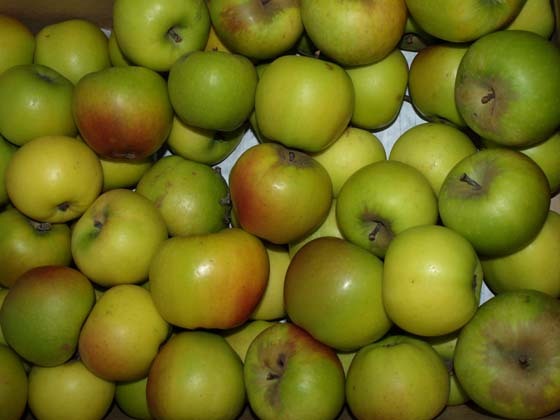 Pippins are good off the tree in late October or early November, depending on the year, but they don’t reach their potential until they sit in storage for a few months. 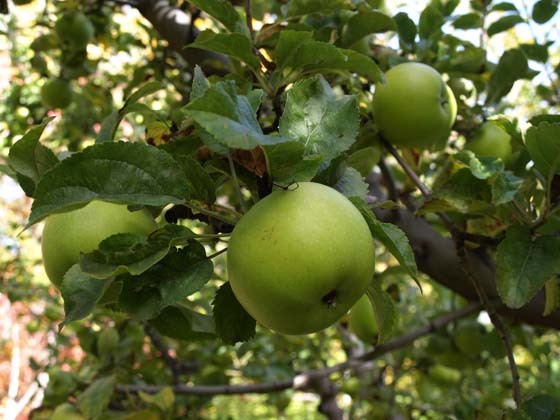 The Newtown Pippin is also noted as being one of Thomas Jefferson’s favorite apples. It was once widely grown as a commercial apple, but has become eclipsed by the Granny Smith, which in my opinion doesn’t come close in quality to the Pippin. We store our fruit in our walk in cooler which has the refrigeration unit turned off in the fall, and has air vents and a fan connected to a thermostat to turn the fan off when it gets too cold, nothing fancy. I have a friend who keeps them in outside sheds in Seattle all winter (be sure to put them in containers to keep rodents out) with great results. A cold porch or basement or spare refrigerator works too. In colder climates keeping them from freezing is important. This entry was posted on April 3, 2011 at 3:29 pm and is filed under Grouse Mt. 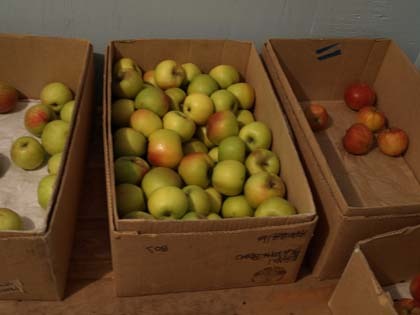 Farm, organic fruit with tags apples, Newtown Pippin, organic fruit, spring. You can follow any responses to this entry through the RSS 2.0 feed. You can leave a response, or trackback from your own site.